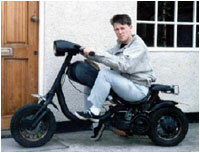 Mark Mortimer outside the Tamworth Trader offices in the town centre on his low-rider Lambretta scooter around the time of the Mortimer & Kelly era. This was basically a situation where I was going through an intensely creative period of my life and I had songs flowing out of every orifice. I'd write songs every day and yet I wasn't really in a 'happening' band to get these songs out and play them live etc. 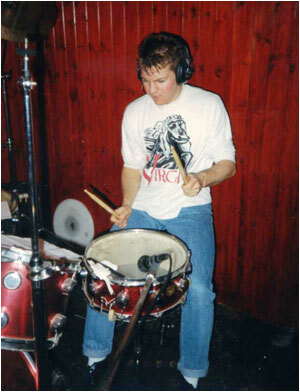 Following the demise of the Dream Factory and the early slow start to the Great Express I just wanted to not stem the flow of songs and although it was costing me a small fortune in recording costs I just couldn't resist popping down to Paul Speare's Expresso Bongo studio whenever I could to lay down some demos. As I was never a strong vocalist I wasn't able to sing lead vocals on the songs so I roped in well-known Tamworth musician and folkie Martin Kelly whose voice I had always really liked to hear because he had this John Martyn-meets-Nick Drake thing going down! Anyway, to cut a long story short Martin ended up being the vocalist to express the songs I was writing and this collaboration continued post The Great Express and really mutated into what eventually became (briefly) The Space Seeds. As well as singing, Martin would play some of the guitar parts (I would play the rest) and although I played a lot of the instruments on the demos we did have a fascinating cast of Tamworth-based friends and fellow musicians who came into the studio to help breathe life into the songs. I was living in a freezing cold, damp bed-sit on Upper Gungate near QEMS and it was a miserable existence; I was also hosting a series of almost legendary 'Yellow Submarine Parties' there with fellow Tamworth band people and hep-cats which was great fun and it was a very creative time in my life although, in some ways thoroughly depressing. Recorded at the Expresso Bongo Studios, Tamworth. 'Mollusc Number 9' (summer of 1987) was my first venture into this hectic and creative period of my life which came towards the end of The Great Express and this recording was a completely crazy, surreal, stupid slice of sonic tomfoolery. 'Mollusc' (or "Mol" for short) was the nickname of a Queen Elizabeth Grammar School German teacher under the name of Mr. Short and back in 1978 when in an imaginary punk band with the likes of Matthew Lees called (brilliantly) 'Filth' we 'wrote' songs like 'Hey Mol' which was The Beatles' 'Hey Jude' with gloriously childish, gleefully vile punk rock lyrics about the lovely Mr. Short! Anyway, for whatever reason, I decided to then do this complete load of nonsensical rubbish called 'Mollusc Number 9' in which I ripped off John & Yoko's 'Revolution Number 9' freak-out from 'The White Album' by keep repeating the title ad nauseum over a strange bass line that I played over the top of a drum machine together with almost silent synths, very quiet guitar and spooky wind-noises (me blowing down a microphone). I then read back the lyrics (which were deeply personal) over the top of this cacophony but spoke them in a range of silly accents while incredibly off my face. I am pretty sure Paul Speare thought I had lost the plot (I had). If 'Mollusc Number 9' was bizarre and un-listenable then the next thing I did – 'Autumn Girl' was one of the best things I ever came up with and, though it has its weaknesses, still oozes a certain lovely charm that is very precious to me. My marriage had collapsed only after eight months and the young girl I had fallen in love with - Christine Egan from Glascote Heath - had then emigrated to live in Bavaria to work as an au pair which broke my heart in two. I thought it would be cool and also romantic to write her a love letter but in the form of a song so that's what 'Autumn Girl' became. I wrote the song and did a portastudio instrumental demo version of it at Barry Douce's flat on the Kerria, Amington Heath (Barry being the ex-DHSS, ex-Dead Captain Speaks bass player who was at that time playing keyboards as part of the touring Mighty Lemon Drops band) [I know I lived next door to him and spent many an hour banging on the wall to get him to jack it in so I could get some sleep, Ed]. I then took it to Martin Kelly's house at Hockley and sang my love letter to Christine to him as we got drunk and between us we moulded it into better shape and then went into the Expresso Bongo to record it. Andy 'Batman' Holt, who had been the Dream Factory's last sticksman, put the drums down with me playing bass and The Great Express' Ted Wilson played some lovely electric 12-string guitar and that became the basic backing track. Fellow Great Express guitarist Julian Amos added some 6-string electric guitar and I strummed two acoustic guitar parts as overdubs as the song began to take shape. Over a period of a couple of days Paul Speare then added some jazzy flute while Barry Douce put on some sitar-sounding keyboards and strings from his Lemon Drops sampling keyboard while Great Express keyboard player Chantal Weston also played some keys. I overdubbed some MORE keyboards (it was getting to the stage where the kitchen sink was soon to follow) and Martin Kelly gave a really strong emotional lead vocal that really tugged at my own heart strings. Backing vocals featured Tim Goode (the ex-Dream Factory lead singer), Ted Wilson, Julian Amos, myself and Martin. It was an exhausting and exhaustive recording but from a personal 'love letter' perspective it said everything I wanted to say to Christine. Within a couple of weeks I was both amused and embarrassed to note that I had subconsciously stolen parts of a 1966 song by US psychedelic band Love called 'Orange Skies' which had been the song Christine and I loved listening to together and although it wasn't a deliberate thing I thought it was quite sweet in a way. I mailed a cassette (as it was in those days!) of the tune over to Christine in Munich but sadly the distance between us was so difficult we did split up although two years later we got back together when Christine returned to the UK and I fulfilled an ambition by playing 'Autumn Girl' live at our wedding reception in 1993 with Martin Kelly on lead vocals and Paul Speare playing the distinctive flute melody. After what was a lovely, sweet idea, the next recording, 'Mollusc Number 5' came in the summer of 1988 and was just an in-joke, a kind of p*ss take of the then trend marriage of heavy rock and hip-hop. Martin Kelly wasn't involved with this one but Gavin Skinner was brilliant, singing an hilarious lead vocal à la Beastie Boys while Ted Wilson's crunching, snarling rawwwwck guitar was utterly spot on. Fun! Fun! Fun! Next up was a song that I had always wanted to release as a single with The Dream Factory – 'Feel Your Touch' which was a sort of Dexy's-meets-Style-Council-meets-The-Tams...all poppy and yet northern soul. It was a crying shame that the Dream Factory never had the opportunity to release it as it was, along with 'Love 15' an incredibly commercial tune that was radio-friendly. Anyway, as I was re-igniting my friendship with Neil Rushton at the start of 1988 while I was doing some press hype work for his Kool Kat house and techno label I decided to give 'Touch' a fresh lick of paint (with the blessing of Tim Goode and Lloyd Barnett who had co-written the tune a few years earlier). Martin Kelly sang the song and went for a Van Morrison-tinged soul vocal while I played bass guitar and bass keys over a Gavin Skinner rhythm track that was part programmed and part live. Guitar on the track was played by Stephen Ellis, the lead singer of Acoustic Shock. Keyboards were played by both the Great Express' Chantal Weston and Paul Speare and the Expresso Bongo Studio main man also contributed some scorching baritone sax and some tenor sax. To build up the horns sound I recruited former Dream Factory players Andy Codling (alto sax) and Paul 'Biffa' Stansfield (tenor trombone) while trumpet duties were handled by Dance Stance's Guy 'Stav' Greenway. The horns sounded thick and powerful but Paul Speare wanted to go really over the top so we double tracked them and then added a whole new layer of brass over the top of that meaning it was an enormous horns sound! Backing vocals were sung by my sister Nicola Mortimer and Stephen Ellis and to cap it all we had a James Brown-esque 'grunt' in the song which the then Tamworth Herald reporter Dan Collins who was later to move on to the Sun and The News of the World, carried out with aplomb. I had hoped that Neil Rushton would release the track on Kool Kat together with some house and techno mixes of it but it never happened and I ended up wasting yet more hundreds and hundreds and hundreds of pounds though the experience was enjoyable and it kept my creative juices flowing. Tamworth recording ‘Feel Your Touch’ the old Dream Factory song. 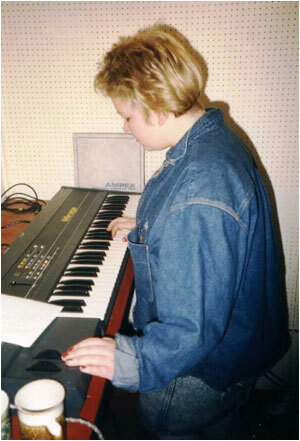 Ex-Great Express keyboard player Chantal Weston playing keyboards at the Expresso Bongo during the demo recording of ‘Feel Your Touch’ in February 1988.